Regrettably the broadcastings of even those home based media outlets which proclaim impartiality and independence are inclined towards a specific side. The defects and faults of Mujahidin are painstakingly explored and exaggerated by making mountains out of molehills. On the contrary, the shocking crimes and felonies of mercenary forces of puppet Kabul regime as well as those of foreign invaders are intentionally concealed and buried in the sand. In the recent past, tens of innocent ordinary civilians were brutally martyred and injured in the blind aerial bombardment and indiscriminate gunfire and mortar shelling of foreign invaders and their mercenary forces in various parts of the country. Hundreds more were ruthlessly tortured, intimidated and their houses looted however most of the media channels adopted an awful silence and have not aired anything in this regard. On Tuesday 5th April, ‘The Afghan Islamic News Agency’ reported that a civilian house was raided in Matun area of Khost province by a notorious commander of special forces named Marwat in which two innocent women were martyred while two other women and a man were severely injured. The assassin (Marwat) is the commander of the unrestrained militiamen who are known as ‘Campaign Force’. This force was set up and funded by the brutal foreign invaders. The above incident was also confirmed by Faiz Ghairat, the general security commander of Khost. On Thursday 7th April, nineteen innocent civilians including local chieftains were brutally martyred in an indiscriminate drone strike of savage foreign invaders. The targeted people were travelling in three separate vehicles. They were on the way to solve a dispute between two local tribes when they became the victims of this brutality. 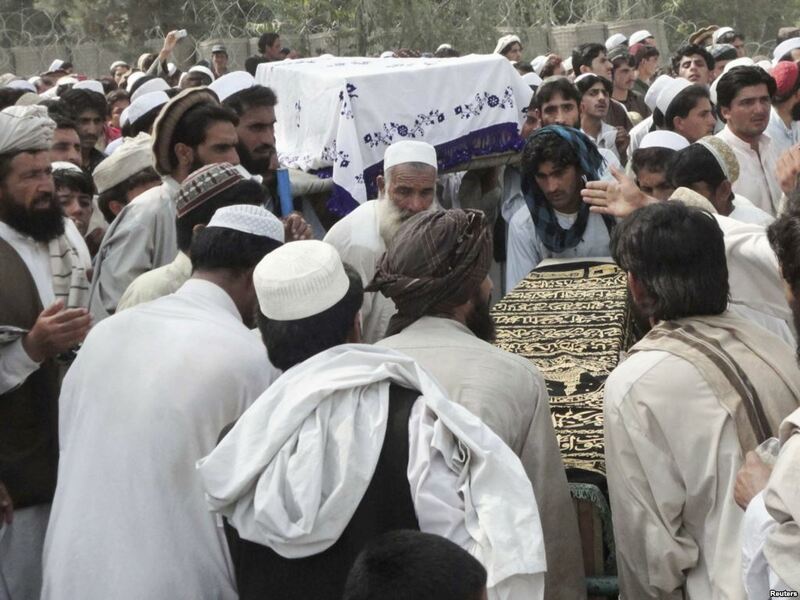 On the same day, a civilian vehicle near Pachir market of Pachir Agam district in Nangarhar province was hit by a drone strike in which a religious scholars, Moulavi Abdul Salam and Pir Qamaruddin, were martyred and three other civilians seriously injured. On Saturday 16th April, ten innocent countrymen were martyred and two others were incarcerated in Kharwar district of Logar province during the savage night operations by foreign invaders collaborated by their internal mercenary forces. According to the local eye-witnesses, seven civilians including women and children were initially awakened then ruthlessly martyred. In these operations, three more innocent persons of two separate families were also martyred. On Sunday 17th April, civilian houses in Viyani and Landi Karaize areas of Shah Wali Kot district in Kandahar province were raided by foreign invaders in the series of their brutal night operations, in which several vehicles of local people were burnt and a number of innocent people were forced out of their homes and taken away as prisoners. On Wednesday 20th April, two innocent women were martyred and six children and women were seriously injured in the indiscriminate shelling of internal amateurish soldiers in Dast-i-Archi district of Kunduz province. On Thursday 21st April, the houses of local people were searched by the savage internal mercenary forces during a raid in Sabari district of Khost province, in which innocent civilians were terribly beaten while an infant and his parents were ruthlessly martyred. On the same day, civilian houses in Yamgan district of Badakhshan province were indiscriminately bombed by puppet regime forces, in which five civilians including women and children were martyred and wounded. The above mentioned civilian losses and casualties were never even alluded to by world media nor by home based media outlets. Now the question is, were the victims of these brutal incidents not Afghans or human beings!!? Undoubtedly all these civilian casualties were innocent Afghans however the main difference is that they were killed and wounded in the attacks of foreign invaders and the mercenary forces of stooge Kabul regime therefore their blood was not thick enough to draw to have warranted any airtime by the supposed impartial or independent media channels!!! The behavior and conduct of most media outlets reveal as if – according to their self-made rules and regulations – all the people living in the areas controlled by Mujahidin are terrorists whose killing, injuring and incarceration is not a crime and their losses draw no condemnations. In reality it only reveals the self-contradictory character and dualistic behavior of western slogans of freedom of press and speech. It means that mocking religious rites, abusing national values, deviating from creed, provocation of ideological are branded as freedom of speech while defending one’s legitimate rights of freedom, dignity and sacred values, which are in conflict with their vested interests and malicious objectives, is labelled as Terrorism!! !